Skull fracture surgery. 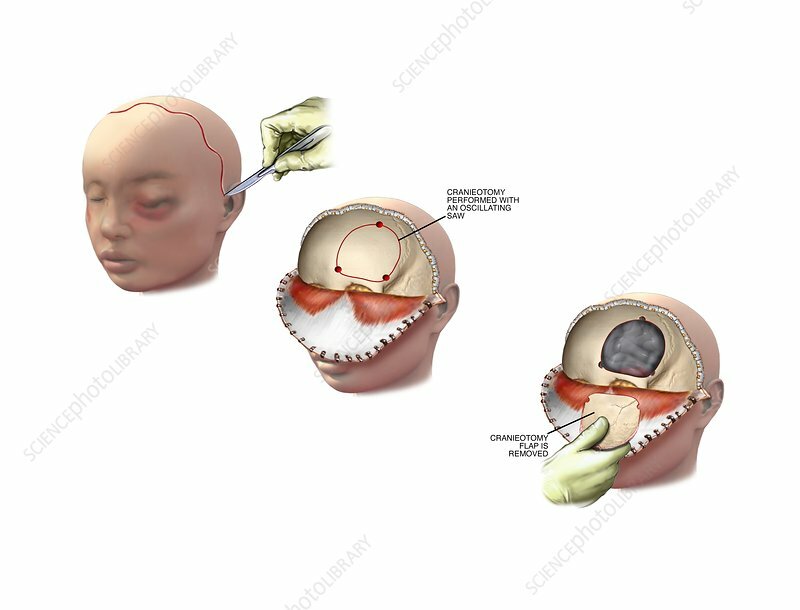 Artwork sequence showing stages in surgery for open reduction and internal fixation of a fracture of the orbital part of the frontal bone of the skull. At upper left is the incision site, with a scalpel used by a surgeon. At centre, the scalp has been drawn forward (a bicoronal flap) to expose the superior orbital rim. An oscillating bone saw is used to perform a craniotomy where a section of the skull is removed to expose the brain (lower right). This may be done to relieve brain swelling and pressure caused by the blunt force trauma that fractured the skull. The skull flap may be repaired or replaced, secured with metal plates and screws.